Mary and Adam had such a lush day at the amazing Wharfedale Grange in December, with a lovely church wedding, followed by a tractor ride to the venue! There was Live Music, a Cocktail hour and Sparklers on the evening, all of which made for amazing pictures! This wedding was recently featured on Brides Up North if you want to go check out the feature!! 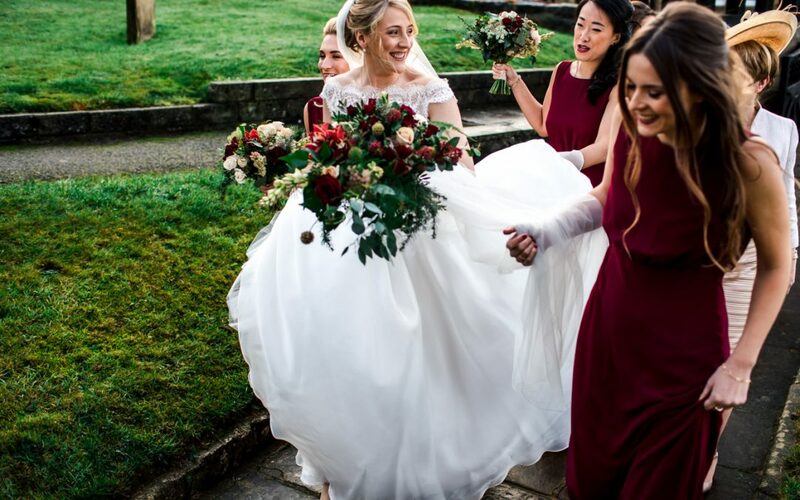 The wedding ceremony was held at All Saints in Bramham, where Mary grew up, and they felt it was important to be married there, as there was a lot of sentimental memories for her family there. Mary and Adam then headed by JCB Tractor to Wharfedale Grange after doing an impressive five point turn, although they and the rest of the wedding party got caught behind a road sweeper, typical! As they arrived at Wharfedale Grange, they were greated with a drinks reception, roaring fires and Christmas trees, just as the sun was starting to go down, which was pretty beautiful. After speeches and the meal were done, it was time for cocktails and some dancing as The Wilde Ones took to the stage, before we headed out for some sparkler pictures! Mary and Adams top piece of advice for couples planning their wedding is to listen to everyones advice, but certainly do things your own way if you feel strongly about it! Would you like a lovely brochure!? Fill in the form below!